The mixSorb S provides unique capabilities to investigate novel materials, like MOFs COFs etc. by mixed gas adsorption. Novel materials are in focus of research in recent last years. These materials can have very high selectivities due to their extraordinary surface chemistry and have to be investigated by mixed gas sorption for a deeper understanding of their sorption behavior. 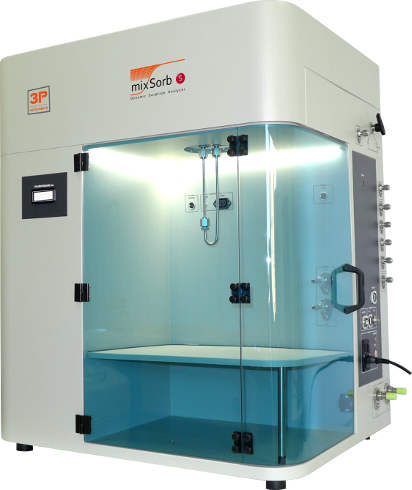 In contrast to mixSorb L the mixSorb S is ideally designed for very small sample amounts (powders). Especially R&D groups have now the possibility to measure new synthesized materials by complex dynamic sorption processes in a wide field of different gas- and gas/vapor-mixtures by using different parameters like: pressure, temperature gas velocity/dwell times, cycle tests and much more. These experiments allows to get data, next to the effective adsoprtion performance, of kinetics, co-adsorption phenomenon or displacement effects, sorption selectivities, data of gas mixture adsorption and heat balance of the sorption process. By using of the available vapor option it is possible to work up to 2 completely independent evaporators to form fully automated individually gas/vapor mixtures fully automated. These data allows a profoundly look to co-adsorption phenomenon or displacement effects. The related modeling software 3P sim made it possible to calculate and to modify pure gas isotherms as well as breakthrough curves and to calculate the behavior of gas/vapor-mixture equilibria.